Create & Send. You do the marketing, we’ll do the rest. Import your creative with a single click and use our integrated testing tools to make sure they look great in all email programs. Then send to your hearts content. Create your email designs using your favorite tools and then import them into your account with the click of a mouse. We'll automatically move all your CSS inline for the best results in email clients like Gmail and Outlook. What you'll get is all your campaign images hosted at no additional cost, plenty of design advice and a gallery of inspirational examples to help you create something awesome. We'll also run your campaign through popular spam filters at the desktop, server and firewall level before you send it. Read more and see screenshots. We make it easy to send email campaigns for yourself, but what if you need help putting it all together? Templates to the rescue! Learn more about our templates feature. You can easily turn any email design into a simple, re-usable template to add content to, use any template from our template libraries, or we can create custom templates for just for you. We've even given you a head start with over 30 fully tested email templates you can take and modify for your own needs. Automatically create and send campaigns from your own apps using our API. Full control over when your campaigns are received. Download great looking templates that work in all major clients. 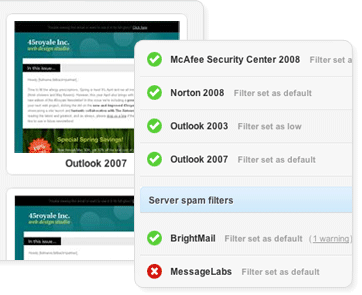 Track the opens, clicks, forwards, unsubscribes, bounces & more. Track your campaign related sales and conversions in GA. 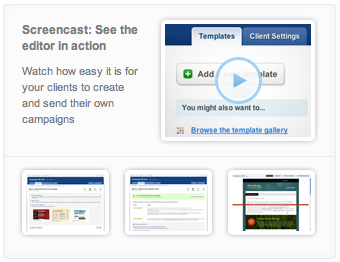 Build templates and let your clients send their own campaigns with ease.